Wanna know why there won't be a peace dividend? Almost 23 years ago, I wrote a short pamphlet, Defense Power Games. My aim then (as it is now) was to explain why the end of the Cold War would not produce a peace dividend in the form of reduced defense budgets that were substantially lower that those averaged during America's Cold War with the Soviet Union. Take a quick scan of Defense Power Games ... now watch this 25 minute video -- America's War Games -- (also on youtube here) just released by Aljazeera for its People and Power segment. "What has changed since the Defense Power Games pamphlet was published in 1990?" "Will the end of the War on Terror produce a dividend?" I submit the answers are self-evident: (1) "Nothing" and (2) "No"
But one thing that has changed: Our economy is in far greater trouble today than it was in 1990, although the seeds for the current disaster were being merrily planted during the late 1970s and throughout the 1980s, as well as in the 1990s, not to mention the first decade of the 21st Century. And this time around, it ought to be clear that continuing to assign grossly excessive amounts of scarce resources (capital and skilled labour) to defense spending will make America's current economic problems worse. So, how can we reduce the defense budget to free up the funds needed by both the private and public sectors to reinvigorate our economy? Clearly, President Obama's most recent budget provides no answer -- He has placed defense off limits. Moreover, the President and Congress are clearly maneuvering to neuter the effects of the budget sequester on the Pentagon's weapons boondoggles by focusing on furloughing people, cutting back on training, reducing spare parts purchases, etc. Over the years (since the 1970s), my colleagues and I have written extensive diagnoses of the Pentagon's institutional problems together with many recommendations about how to correct the Pentagon's dysfunctional behaviour. Over time, our central conclusion has remained the same: It is not only possible to reduce the defense budget, but budget reductions are a necessary step in reforming the pentagon's wasteful management practices to produce a more effective military (should it be truly necessary to use it, which is usually not the case). 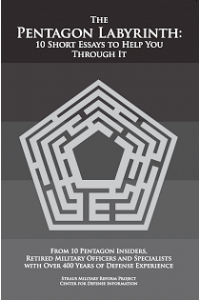 It is our pleasure to announce the publication of The Pentagon Labyrinth: 10 Short Essays to Help You Through It. This is a short pamphlet of less than 150 pages and is available at no cost in E-Book PDF format, as well as in hard copy from links on this page as well as here and here. Included in the menu below are download links for a wide variety of supplemental/supporting information (much previously unavailable on the web) describing how notions of combat effectiveness relate to the basic building blocks of people, ideas, and hardware/technology; the nature of strategy; and the dysfunctional character of the Pentagon’s decision making procedures and the supporting role of its accounting shambles. Download the whole book in .pdf format, or find individual essays and supplemental materials below. Careerism. Col. GI Wilson, USMC, ret. Confused Alarms of Struggle and Flight: A Primer for Assessing Defense Strategy in the post-Iraq World. Col. Chet Richards, USAF, ret.